Within Seoul, we used taxis almost exclusively, because we found it was usually faster and more cost effective than taking public transportation with three people. The times we did use public transportation, we mostly used the Metro, which was very convenient from our hotel, once we found a 7-11 in the Metro station so we could buy reusable ride cards. Although you can use Uber in Seoul, the cost is about double the cost of a taxi. 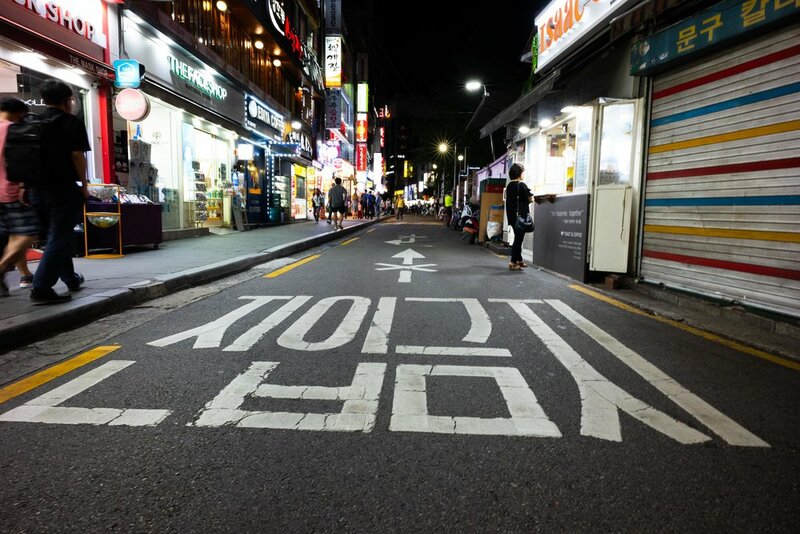 Many locals use the Kakao Taxi app, which calls a taxi for you and preloads your destination into their GPS – you pay the driver a metered fare just as you normally would. We downloaded the app but never used it, simply because there was always a taxi readily available, all used the meter, and none seemed to take round-about routes or any of the tactics you sometimes encounter elsewhere. If you do take taxis, definitely try to have the destination printed out or called up on your phone in Korean if at all possible. I would hand the driver the paper with the hotel name and address on it in English and Korean. He would study the paper, seem confused, and then shrug. He would then attempt to shout the name of the hotel into his GPS in Korean. The GPS wouldn’t understand him (or, worse, someone else in the car would cough or make any other sound – giggles became common after several days of this), so he would have to yell the location into the phone again. This happened at least four times. Finally the GPS would come up with a route and destination. The driver would examine it quizzically, making us think perhaps the GPS was wrong and sending us to some other town. 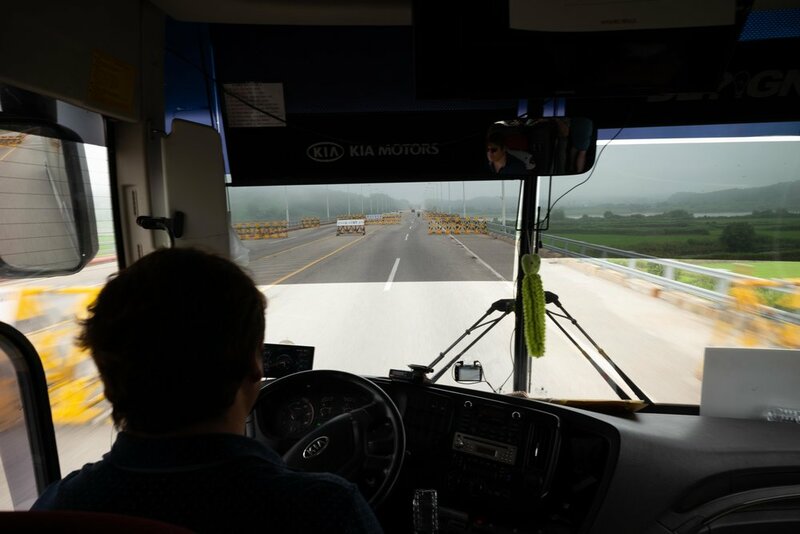 The driver would show the map (in Korean, of course) to whomever of us was in the front seat, none of whom read Korean. They would attempt to study it as though they had any clue, before giving up and declaring it looked right. Fortunately, that was always the case. The most memorable taxi driver we had was a woman who drove with one foot on each pedal, going back and forth continuously (as in gas/brake/gas/brake) for the 15 minute drive to the hotel, all the while yelling at the GPS to get it to reconfigure the directions, because she seemed convinced it was sending her to the wrong place. After that ride, I began insisting that someone else sit in the front seat. We also used the bus, but that was a less easy and less pleasant experience than the subway or taxis. Keith often says he prefers subways because you know where they’re going to go. Usually I disagree, but after baking in a bus that felt more like a greenhouse while the driver turned off the air conditioning and took a 15 minute break, none of us were huge fans of the buses in Seoul. Nighttime hustle and bustle in restaurants. 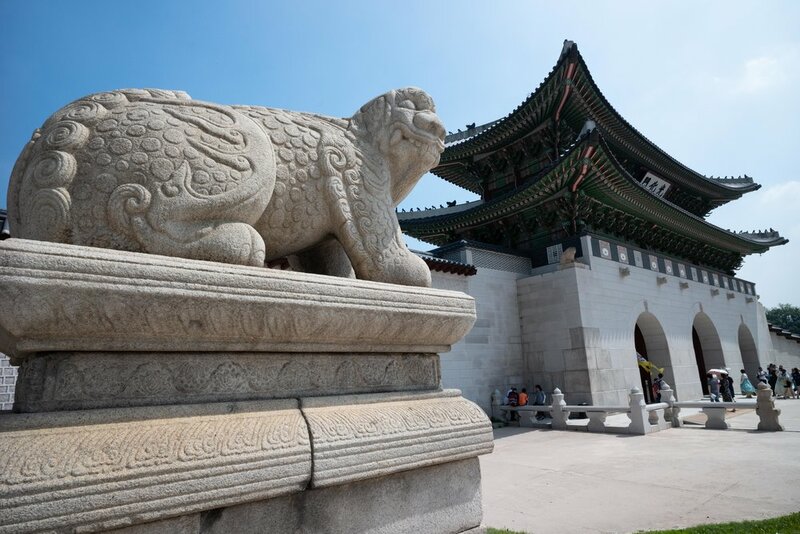 Favorite experiences in Seoul: Within a very short time, we squeezed a surprising amount into our time in Seoul, so this was a hard one to decide. Getting to visit the DMZ and JSA (Joint Security Area) was incredibly interesting to me, in part because I’ve read several books by people who have left North Korea. Walking out of the Freedom House, down the steps to the buildings housing the conference rooms you’ve seen 10,000 times on the news, and getting to stand in North Korea at a time when relationships are so in flux, was a real privilege. We booked the full-day tour through Koridoor Tours. You can read more about our tour here. Another favorite experience in Seoul was doing a small group food tour. You can read more about that in a separate post here. Taking photos of the Seoul skyline from a building at the end of the tour was also a neat experience, particularly in contrast to the touristy and time-consuming N. Seoul Tower. If you’re headed to Seoul, check out that post for directions on how to find the free lookout. Gyeongbokgung Palace was first built during the Joseon Dynasty in the 1300s, but has been destroyed and rebuilt over the centuries. The most recent version was rebuilt in the late 1800s and is enormous. [photo] In addition to the structures themselves, we saw many locals (and tourists) wearing traditional hanboks and posing for photos all over the grounds. Seeking relief and air conditioning, we visited a small art museum and the National Folklore Museum, both located on the palace grounds. The folk museum ended up being a highlight of our trip to Seoul, and not just because of the temperature. We learned about everything from kimchi to ancient Korean farming practices, salt production around the world, and rested on the porch of a traditional home within the museum. The museum is free and the bathrooms are clean, so it’s worth a peek if you’re visiting the Gyeongbokgung Palace grounds. The giftshop is also excellent and fairly priced. For fans of modern architecture, the Dongdaemun Design Plaza, designed by Zaha Hadid, is worth a visit. Besides the architecture, there was great people-watching as the plaza was full of Koreans of all ages. In addition to the stores in the building itself, the outdoor area was full of vendors selling various crafts and food. I’m still kicking myself for not buying hand painted fans at the crafts market. We visited several permanent food markets, and the dried seafood market very close to our hotel was probably the most memorable. I had never seen (or smelled) so many different varieties of dried seafood in my life, and the workers on a very quiet Sunday morning were more than happy to offer free samples, some of which were very good. Others are probably more of an acquired taste . . . . 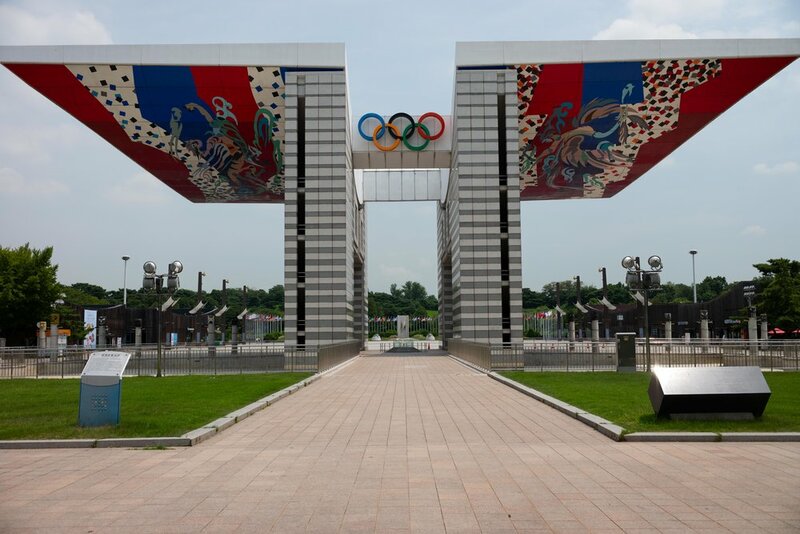 Visiting the old facilities from the Summer 1988 Olympics was also really interesting, though I only recommend it if you’re interested in old Olympics sites or that Olympics in particular. Or traveling with someone who is . . . . Inexpensive Meals: Chicken and beer restaurants are everywhere in Seoul, often located close to KFC locations. (Seriously.) We decided to experience this phenomenon at a location of KyoChon 1991 We got a huge order of fried chicken and potato wedges with various dipping sauces. All three of us loved it, and we appeared to be the only tourists there. We also experienced Korean street food in the Namdaemun Market. It was a great chance to just point at things that looked interesting, and to check out things based on the line out front without necessarily knowing what they were. If you find yourself visiting the Leica store or other camera stores in its vicinity, there is a little coffee stand across the street from Leica that has good coffee, waffles and breakfast sandwiches. And the service was excellent. Just look for the purple awning. If you visit the Gyeongbokgung Palace (and you should), take a short walk to the Bukchon Hanok Village neighborhood. There you can see a traditional, 600 year old village that is now within the city. 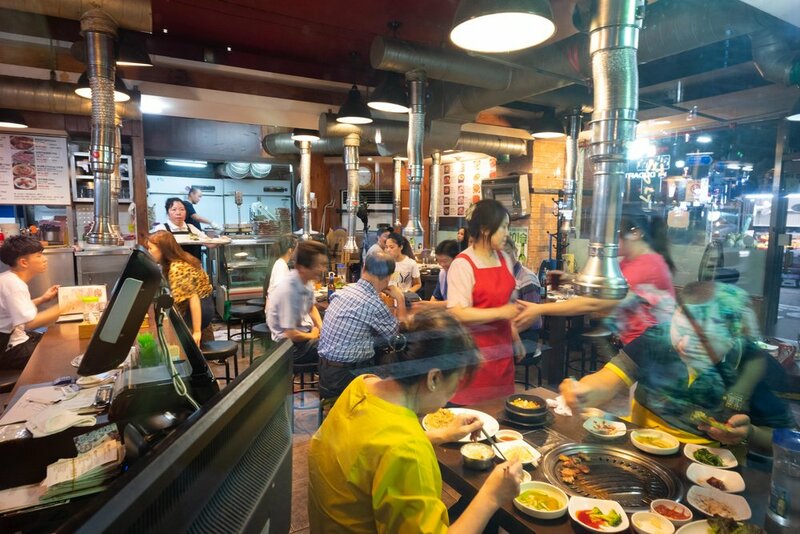 Along with many tourists exploring the narrow alleys and photographing the traditional buildings, you’ll also find numerous reasonably priced restaurants. We enjoyed our lunch at Hwangsaengga Kalguksu (just look for the address – it’s at #78 on Bukchon-ro 5-gil), where we copied the locals and had dumpling and noodle soups. I wouldn’t say the service was especially friendly, but it was fast, and the food was delicious. Nicer Meals: We were only in Seoul for a few days, so we didn’t eat at any nicer restaurants, other than doing the food tour. Lodging: Again, hotel points redemptions just didn’t make sense in Seoul because hotels were so inexpensive. We stayed at the ibis Ambassador Seoul Dongdaemun. It, like the ibis we stayed at in Lima, had small rooms, but it was inexpensive (it varied, but was around $60-70/night), quiet and perfectly fine. Reality check: The two rooms we had (one for us, one for Keith’s mom) were each only slightly larger than the average airplane bathroom. We were very lucky we hadn’t planned to do much work there, because we would’ve gone crazy. It was also a little disconcerting that the “luggage storage” was an area in front of the elevators with a rope around the bags. While we stored our luggage there both before we checked in and after we checked out without any problems, it was certainly an interesting luggage room. The hotel also had the most expensive laundry so far this trip. In a hotel and city that are both relatively inexpensive for people used to US prices, Keith learned a valuable lesson about adding up the cost of the laundry before you submit it . . . . To add insult to injury, as I was preparing this post, I discovered that despite the hotel telling us that breakfast was not included in our booking, our reservation was supposed to include breakfast! The cost of arriving at the hotel hot and tired and not double checking your reservation! Overall: What started off as a free layover to see the DMZ and adjust to the jetlag before the onslaught of Tokyo ended up being a great visit. People are friendly, the history and culture are interesting, the food is great, and the prices are relatively low compared to other major cities. As long as it’s fall or spring, I’d be thrilled to go back to Seoul. Reality check: I realize it sounds ridiculous to complain about heat and humidity when you have the good fortune to visit another country and choose to do so in July. But throughout our time in Seoul, we heard how the humidity and heat were uncharacteristic, and in some cases set new records. On the other hand, there were almost no crowds to see us looking like we had just climbed out of a swimming pool. Have any questions we didn’t answer? Please post them below and we’ll be happy to respond!